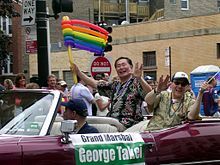 ^ Takei, George (2015-03-10). To The Stars: Autobiography of George Takei. Simon and Schuster. ISBN 9780743434201. https://books.google.com/books?id=OYg1BgAAQBAJ. ^ Willis, John (2000-02-01). Theatre World 1990-1991. Hal Leonard Corporation. ISBN 9781557831262. https://books.google.com/books?id=aFgiEodvfKEC.